A society under the name of Wildlife Conservation Society of Galle was established in 1993 in collaboration with the Maritime Museum of Galle and Galle Municipal Council. The society is registered in the Central Environmental Authority under the reg. no.6/6/17/30. The objectives of the society are to create an interest for wildlife in Sri Lanka among the school children and the general public and work with dedication towards the conservation of the wildlife in the country. To achieve these objectives, the society has made untiring efforts through the conduction of exhibitions, lectures, excursions and many more community based programs in many parts of the country. The society works closely with University Academics, Governmental and Non-Governmental Organizations, foreign experts and Voulnteers etc. giving its services in the way of expert knowledge, field guidance and assistance. During the course of years, our members have gathered vast experience and Knowledge in conservation methods of bio-diversity and are now suitably qualified for undertaking its own research programs. 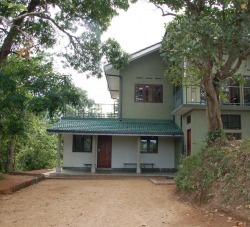 We have now established our own projects office at Galle with sufficient facilities for research. The society has been an equal partner in a number of collaborative research projects assisted form Department of Wildlife Conservation, Forest Department, National Maritime Museum, National Museum, Universities. During the last decade, members of the society had made some pioneering research and have been able discover several new faunal species, thus making a tremendous contribution to our bio-diversity knowledge. Our members have also been successful to re-discover species which were considered as extinct and further more we have discovered some threatened restricted species in new locations where they have not been recorded before. In this center, the society maintains a library, a lecture Hall and Dormitory. At present, school children, University Students, School teachers and General Public use these facilities during their visits to the center. The society also conducts lectures, slide shows, workshop and other educational programs within the rain forest for its visitors. And also this Center is use to rescue and treat and rehabilitate injured wild animals with the corporation of the Department of Wildlife Conservation. Also we had conducted some conservation project to increase the populations of some rare animal groups. Eg. An in situ breeding program for phytotelm microhylid frog Ramanella nagaoi this was the first in situ breeding program in Sri Lanka. Loris 2006 (24) 3-4.and we are conducting a feeding plant introduction program for rare butterflies species Eg. Ceylon rose and Ceylon Bird wing. Members of the Wildlife Conservation Society – Galle has collected 8 new type specimens of tree frogs as a part of the comprehensive amphibian research in Sri Lanka conducted by Wildlife Heritage Trust. Preparation of colorful poster on dragonflies in the lowland wet zone of Sri Lanka to promote the dragonfly conservation as a part of society’s species conservation program. Establishment of the plant nursery to distribute plants for post tsunami rehabilitation projects and reforestation projects. 150,000 plants have been freely distributed and this project is conducting with the partnership with Responsible Tourism Partnership since February, 2007. Eleven satellite plant nurseries have also been established under this initiative. Comprehensive biodiversity assessment of the lowland rainforests in the Galle district was conducted for Biodiversity Secretariat of the Ministry of Environment & Natural Resources. The highlight of this assessment was record of five unidentified rainforest amphibian and three new freshwater fish species from the rainforest habitats of Galle district. Establishment of the breeding centre for freshwater fish and amphibians and animal rescue program has been completed. This is a collaborative project of Wildlife Conservation Society - Galle and the Department of Wildlife Conservation with the financial assistance from Nation Trust Bank. This project was developed to link the NGO’s, government authorities with private sector to initiate knowledge based conservation activities.